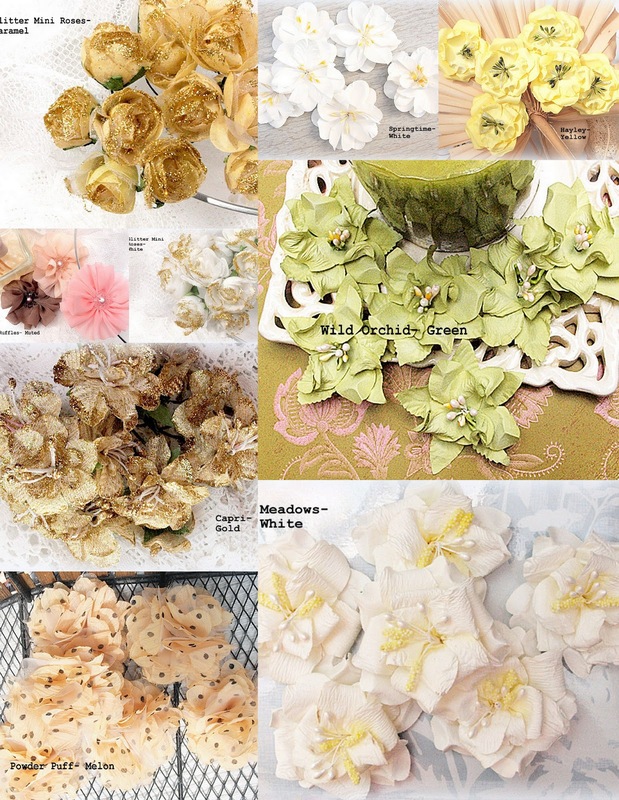 I'm here to share with you my last January project for Manor House Creations, featuring more of their beautiful Spring Collection flowers~! And I've used them here to create a rustic, masculine layout for Wyatt, my ever-curious, question-asking, uber-smart five year old! This photo was taken last summer while visiting the in-laws. My mother-in-law's boyfriend owns quite a bit of pasture and farm land and he leases out his pasture to some cattle farmers. The kids just love to take the trail out to find the cows and on this evening they came right up to the electric fence- which Wyatt thought was just awesome :). I was okay with it...until the bull took an interest and came on over- at which point I made Wyatt step back a ways! I just can't seem to get enough of these gorgeous "Powder Puff" fabric flowers. I've used the "Melon" variety here :). I've used one of the "Ruffles Muted" blooms as my focal flower, and topped its center with a little bit of bling :). There are a variety of other gorgeous spring flowers in there as well, including "Hayley- Yellow", "Wild Orchid- Green", "Capri- Gold", "Springtime- White", and "Meadows". Thanks for stopping by~ have a great day :)~! Being a country girl I really love this.. love the title, and those flowers are divine!! Smukt LO og fin historie, lige ved mit sommerhus er der en mark med mange køer, men ingen tyrer, for det er malkekører, de er nærmest håndtamme. knus morkaren. Hey, I don't mind seeing you on the blog roll. I always look forward to seeing what you made next and this is beautiful! Love, love those flowers! Awesome, love the edges and wonderful collection of flowers. The rolled wire to go with the pic is a very cool idea! WOW, love it! So beautiful, and the pic is wonderful! I just love that photo! pretty LO! That photo is so beautiful and serene and your lay-out really makes it speak for itself :) I just love how you adorned the photo with some lovely flowers and seambinding. Very pretty page! I LOVE this layout, BIGTIME!! It's already in my favourites!! Thanks for the inspiration!